If these animals didn’t wanna be eaten, they wouldn’t taste so good. I recently ordered a Bill Levitz dress from your company because I’m a bridesmaid and I had to order it. I was instructed to send my measurements in, for what I could only assume would be fit purposes. However, sending in this information was merely a waste of time and effort, because when I received my dress, it was twice the size that I am. By no means should I still be watching MTV’s The Real World. But I didn’t invent DVR, and I didn’t expect to have so much free time available to me. Also, I’ve managed to watch almost all of the seasons between watching with my sister all through high school and with my friends when the Real World entered the Skinamax market by filming a season in Las Vegas. Plus, the Real World/Road Rules Challenges have kept me in. 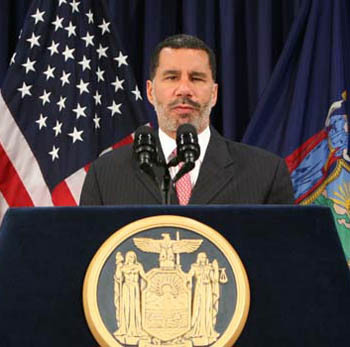 pictures of Governor David Paterson for the past two years. The man is legally blind. He does not know how ridiculous he looks. It is your responsibility to throw a pair of shades on this guy. I know Paterson is on political life support, having withdrawn his bid for a full term as the Governor of New York and now being pressured to step down anytime between now and two years ago. But those of us who watch the news still have to look at him, an effort that would be less distracting if he were wearing sunglasses. Give it a try. Hey, maybe he’ll be able to play piano!